Question of the Week: – What’s your never-leave-home-without-it beauty product? Answer: EASY! My eyebrow powder. Either my SUQQU (forgotten the shade name and it’s in my suitcase!) or my Illamasqua powder in Gaze – which is ironic ‘cos I’ve actually LOST it. I keep meaning to have a mega search but haven’t found the time yet. Beauty Junkies Unite – Don’t miss the new fall collection from Too Faced, we’ve got the breakdown and photos of the Midnight in the Garden of Glamour Collection! Clumps of Mascara – is shocked at how awesome Sally Hansen’s Xtreme Wear polishes are. You HAVE to get Pumpkin Spice. It’s the perfect polish for Halloween. EauMG – Victoria gives video reviews a try. One of her first reviews is of Juicy Couture Couture Couture. This fragrance is a tribute to be florals of the 80’s. Gouldylox Reviews – Brazilian Peels being raved about by everyone I know. But are they worth the price tag if you regularly partake in a peel? Krasey Beauty – Read all about Krasey Beauty’s purple hair transformation! 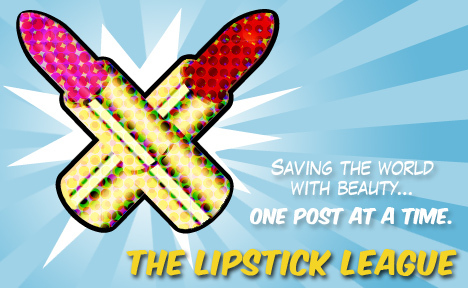 Lipglossiping – wants you to dish the dirt on your worst beauty counter experiences, a trauma shared is a trauma – erm, relived?! Nouveau Cheap – What can a pure white eyeshadow base do for you? Come see what NYX Eyeshadow Base White did for me. Pink Sith – It’s a 12 step meeting. It’s a Zombie Movie. No. It’s Rouge Bunny Rouge Long-lasting Eye Shadow in Delicate Hummingbird. Find out if this screenplay has a happy ending! Prime Beauty – tells us why it’s important to add a facial mask to your weekly skincare routine and lets you in on her top 5 picks! How about you? What’s your never-leave-home-without-it beauty product? Dr Denese SPF 30 day cream. Love this – moisturizer plus great sunscreen. Dries to matte finish.